Director: Kristine Peterson / Writer: Thom Babbes / Cast: Mitchell Anderson, Juliette Cummins, Xander Berkeley, Thom Babbes. While definitely not your average killer-from-the-past tale, Deadly Dreams seesaws between a Halloween-lite psycho slasher and Hitchcockian thriller. Aged ten, Alex (Anderson) bore witness to the shootings of his parents at the hands of a business rival of his father’s. 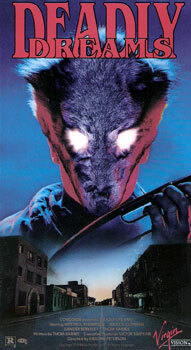 Ten years later he suffers from recurrent nightmares that the wolf-masked killer has come back for him. His power-suit clad brother (Berkeley) offers him nothing but pressure to use his share of their inheritance for his failing business venture; new girlfriend Maggie doesn’t seem to understand, and best bud Danny keeps playing pranks on him in between drug trips. After several brutal subconscious incidents – the best of which has a fab knife-through-pillows filleting – Alex believes he’s actually losing it and his waking encounters with wolfie are hallucinations. Soon after this point, the plot takes a dramatic, fairly unpredictable twist before going hammer and tongs into the woodland finale where Alex learns the painful truth. Impressive as revelation is, it’s nothing compared to the staggering final surprise, one which lifts Deadly Dreams from forgettable video territory to a low-budget gem. Unfortunately, too few people have seen or appreciated it so it remains largely unknown. Gay actor Mitchell Anderson is fine as the agitated lead and it’s always good to see Cummins on screen, while director Kristine Peterson turns in a good looking production that truly deserves more credit than it has so far received. Blurbs-of-interest: Anderson was also in All-American Murder; Juliette Cummins was Robin in Friday the 13th Part V, Psycho III, and Slumber Party Massacre II. Finally! Somebody else wo appreciates this underrated gem! I love the wolf mask and I love the unexpected twist in the end! Yeah, a remake of this on a bigger budget would be awesome.